"You can fish in the gutter with your pearls, but not for Simonetta!" Although Lon Chaney is best known for his amazing makeups, he often played quite straight roles, with only modest makeup. But a consistent feature of his films was the theme of frustrated or unrequited love. This two-disc collection compiles three of Chaney's pictures, where he seldom resorts to much makeup but nonetheless never gets the girl. Ace of Hearts (1921) features Chaney as Farallone, member of a secret society of anarchists who have determined to assassinate an evil capitalist (Raymond Hatton). The member of the society dealt the title card will be assigned to kill the rich man, using a bomb. Although Farallone strongly desires to get the assignment, Forrest (John Bowers) draws the card. But Forrest begins to falter in his determination when he falls in love with fellow member Lilith (Leatrice Joy), whom Farallone also loves. Based on a novel by Gouvernour Morris (who also wrote The Penalty, Chaney's first big starring vehicle the year before), this picture is firmly rooted in the Red Scares and Palmer Raids after World War I. There's some interesting camera work, particularly in the scenes where the cards are slowly being dealt. An overhead shot gives a feeling of impending fate, while intercuts to the faces of the unnamed society bring home their own emotions in a parody of da Vinci's The Last Supper. Unfortunately, Chaney has a tendency to overact a bit here; the subtleties of his later performances are here but at times smothered by some overly large emoting. This picture was directed by Wallace Worsley, who would memorably work with Chaney again on The Hunchback of Notre Dame (1923). Far better is the second of Chaney's clown pictures, Laugh, Clown, Laugh (1928). Here he plays Tito Beppi, who entertains under the name Flik with partner Flok, or Simon (Bernard Siegel). They find an abandoned young girl and raise her as their own, under the name Simonetta. When she has grown up (a 13-year-old Loretta Young) she also takes to the stage, working the tight rope. When she meets Count Luigi Ravelli (Nils Asther), the noble immediately falls in love, but Tito actually loves her himself. Torn by his parental affections and his amorous love, Tito plunges into a severe depression and contemplates drastic action. While his makeup here is straight, Chaney does age himself convincingly over a few decades. His scenes are often heart-breaking, and it's one of his strongest roles. Young is already luminously gorgeous, and she demonstrates a good deal of talent at a young age. The clown sequences are well staged and Chaney throws himself into the dual role with great enthusiasm. Unfortunately, about half of a reel is lost from the film, making for some continuity problems when Simon leaves the act and then suddenly reappears, but the gaps are filled in on the commentary. The eight pictures that Chaney made with Tod Browning were almost all sick and twisted, but few were quite as sick and twisted as The Unknown (1927). This time out, Chaney plays Alonzo the Armless, a circus performer who throws knives and shoots guns with his feet, but doesn't let on even to his compatriots that his arms are just straitjacketed against his body. Alonzo is in love with Nanon (Joan Crawford), daughter of the circus owner. Nanon has an irrational fear of being touched by men's hands, to the chagrin of Malabar the strong man (Norman Kerry). Seeing his opportunity, Alonzo has his arms amputated and returns for his triumph. But things don't quite turn out as he expected. As was the case in the painful getup he wore in The Penalty, the requirements of this picture were similarly difficult for Chaney. The sequence where he confronts Nanon and Malabar after his operation is a masterful piece of both editing and surprising restraint as he dissolves into utter madness. Despite its short running time (a mere 49m:27s), it's an unforgettable picture. Crawford is quite striking in this early role, giving the part an unconscious sexuality that really steams up the screen. Norman Kerry reunites with Chaney from their turn together in The Phantom of the Opera (1925), but he in no way, shape or form convinces as a strong man. A good variety of scores accompany these pictures. The first two are scored by winners in the competition held by Turner Classic Movies. Both are appropriate and well-done, though that for The Ace of Hearts, like the picture itself, is occasionally a bit overwrought. A percussive score by the more controversial Alloy Orchestra provides the backdrop for The Unknown, and the odd sound fits the off-kilter proceedings quite well. These make for a good introduction to Chaney the actor, as opposed to Chaney the makeup wizard. But Warner still controls plenty of other Chaney pictures inherited from MGM, and I hope we'll also see those on DVD before long. Image Transfer Review: The transfers are quite nice, though the source prints have seen better days. The earliest film in particular suffers from heavy wear in places. The other two have occasional scratches and regular speckles, but all three films are from early generation materials and have a good deal of detail and attractive visuals once you get past the damage. Black levels are very good, and greyscales are excellent for the most part, although a few bits (apparently restored in from other prints) have a dupey and contrasty look. The films are not tinted, though at least the earliest one certainly was on original release. The films are run at visually correct speed. Audio Transfer Review: The soundtracks are exceedingly clean, with a good broad soundstage. There's good depth and very nice base presence. Sound effects are incorporated into the scores, though they are for the most part limited to such things as knocking that could have (and would have) been performed by the theater organist. Absolutely no complaints here. Extras Review: Warner provides a ton of well-deserved extras for these pictures. Robert Osborne, host of Turner Classic Movies, provides a friendly welcome and a bit of background. Michael F. Blake, author of three books on Chaney, provides full-length commentaries on all of the features. In addition to scene-specific comments, he gives a history of the Goldwyn studios and MGM, a sketch of Chaney's career, an appreciation for Chaney's talents, filling in lost footage and describing the lost alternate endings of Ace of Hearts and Laugh, Clown, Laugh. Each picture is also represented by a 20-frame image gallery that includes stills (with some from the lost sequences), lobby cards, and presskits. The two films that were the subject of the competition also have featurettes on the composers of the scores. 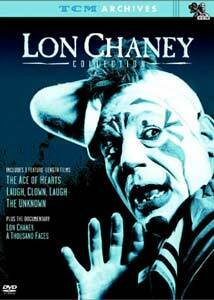 On a broader spectrum is the lengthy documentary by historian Kevin Brownlow, Lon Chaney: A Thousand Faces (1h:25m:09s). This excellent overview of Chaney's life and career also features Blake prominently, as well as descriptions of how Chaney accomplished his makeup, and a ton of rare clips from Chaney's films. This documentary is invaluable, though the clips do demonstrate the persistent PAL-NTSC ghosting prevalent on transfers done through Brownlow's Photoplay Productions. Finally, the photo reconstruction of the notorious lost Chaney film, London After Midnight (1927) closes out the disc, with a score by Robert Israel. Rick Schmidlin had previously had some success doing a photoreconstruction of von Stroheim's Greed (1923), but there was at least a good deal of actual footage to work with. Here, one can't get a sense of Chaney's skill in movement, and the static nature is deadly dull. If it actually represents the picture well, then the thing makes no sense whatsoever. But it's probably as close as we're ever likely to get to this lost treasure, with the amazing vampire makeup by Chaney featuring sharpened teeth and a ghastly frozen death mask rictus. Three Chaney classics, an epic-length documentary, commentaries, and excellent transfers. What more could you ask for? Well, volumes 2 and 3 of the Lon Chaney Collection!